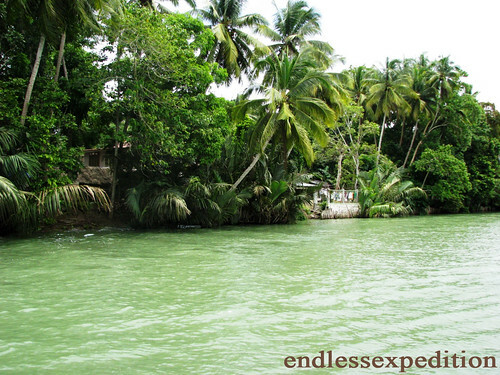 The Municipality of Loboc is situated in the Southern Part of the Beautiful Province of Bohol. Just 24 kilometers away from the Capital City of Tagbilaran, it was the very first stop during our Bohol Island Day Tour last August 2010. 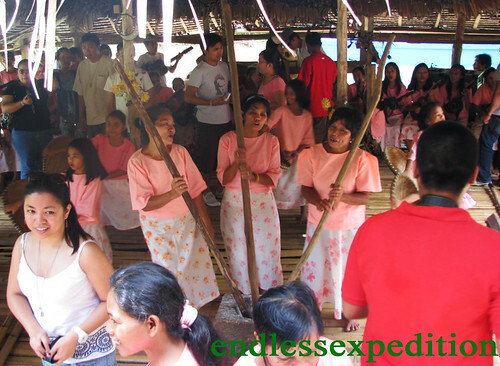 The town is famous for a number of things including the Philippine Tarsier, which was already featured on my past posts, the World-Famous Loboc Children's Choir, the Magnifical Loboc Church and my feature for today, the Loboc River. 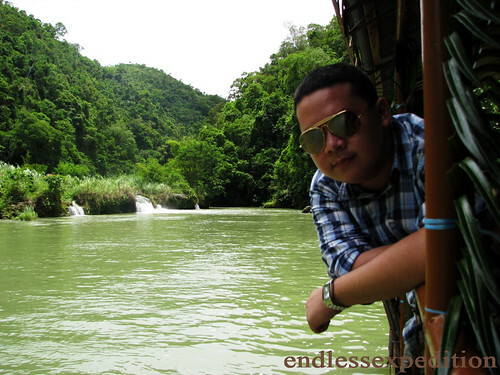 Loboc River has been hailed for so many years as the Philippine's Cleanest River. The water might not be that clear when we went there but it surely is Clean! It was deep according to the guides on our Balsa or raft which is being pushed by this small speed boat and give you a good tour along the river for about 30 - 40 minutes. 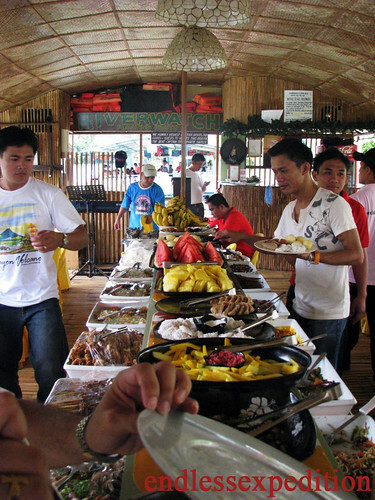 Of course, Loboc River Cruise will never be complete without it's buffet Lunch. Just for Php400.00, the Cruise caters native Filipino Dishes like the famous Pancit or Stir Fried Noodles, Pinakbet, Kare-Kare, Pork Barbeque, Fried Chicken, Unripe Mangoes in Bagoong and a lot more. For dessert, Fruits such as Watermelons and Pineapples are served together with traditional ricecakes such as the Putong Puti, and my favorites Kutchinta and Peche-Peche. Together with your wonderful view of the Riverbanks and the life that surrounds it, A Small Live band serenades you with different songs ranging from the Kundimans to Air Supply and they even sang Traditional Korean Songs for the Korean Guests that were with us during the Cruise. As the Balsa made its way at the end of the River where a small waterfall was, we thought it was the end of the cruise and we are just on our way back. But as we passed by where we have been earlier, There is another Balsa but this time, the Balsa was stationed by the river filled with Boholano children and women in their colorful Pink traditional Baros all waving at us hello. Then our Balsa suddenly made a halt in front of that Balsa and open the doors of ours. Some of the Tourists came to the Balsa of the Singers as they started singing songs with their synchronized choreography. Here, it was the best part of our whole Bohol Trip and I am going to share it with you. As the Choir started singing a Mellow Song and the tourists started singing along and some are taking photos of them, I started to feel something. I am not feeling sad at the moment but I can't stop the tears falling in my eyes (this is when my Wayfarers are of great use). While watching these Performers sing, at that very moment, I was feeling very very proud again to be a Filipino. I have always been and will always be proud but at that very moment, it reached top heights. Seeing all these Foreigners and Local Tourists enjoying the songs make me feel a bit guilty. I am a Filipino, these are my People! These Boholanos are my people and I should not be here just watching them. I should be there presenting how great the Filipinos are. At that very day, I realize that my Love for the Filipino people, My People will never ever Linger. Whenever people scrutinize or just plainly make fun of Filipinos, I get truly hurt. Maybe it's not that I am emotional, It's because I just love my People so much. And if only Pinoys like me would Love our Country as we love ourselves, then our brothers and sisters from other nations would learn to see the beauty and greatness of the Filipino People. To the Filipino People, we must learn to love our Country. We can be Doctors or Engineers or Teachers like me or even Beggars and Orphans but one thing is for sure, we will ALWAYS be FILIPINOS! If we could only learn to love our own, that is when other Nations will start to look upon us. And to our brothers and Sisters from other Nations, I have always have this Big Love for all the Cultures of the World and I have so much respect for all of you, and in this way, I hope that you will also see how beautiful my Country is through this blog, its sights and sounds but most of all, the best thing about the Philippines, the FILIPINOS! 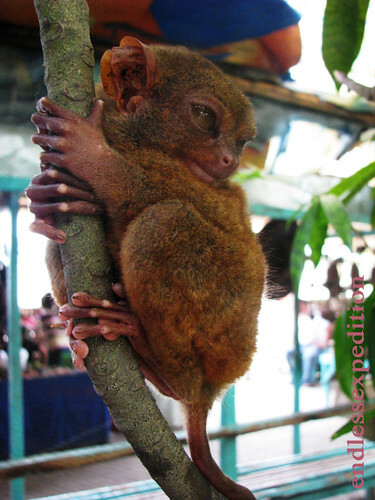 Called Maumag in the Visayas region, the Philippine Tarsier is one of the smallest Primates in the world. It is endemic to the Philippine Islands of Leyte, Samar, Mindanao and where this photos where taken, in the province of Bohol. During our Visit in Bohol last August, it was one of our first stops, the Tarsier display where this Tarsiers can be seen on this little shrubs for free, you can give your donations if you like. The Philippine Tarsier is one of the two primary icons of the Province of Bohol together with its Magnificent Chocolate Hills. According to the IUCN, it is classified it is classified as Nearly Threatened. Although this Tarsiers are a sight to see, we must always remember that these are also creatures that lives a life so we must treat it with much respect as we treat other people. 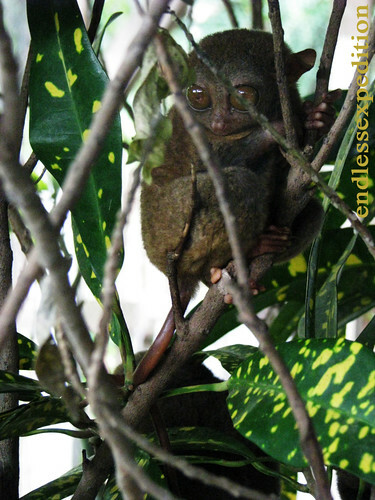 The Tarsiers feasts on live insects such as bugs, spiders, crickets and even grasshoppers. Though they are particularly a prey to larger animals such as wild cats, larger birds and of course, us Human Beings. These cute little primates are nocturnal meaning they are shy and sleepy during the day but much more active during nighttime. 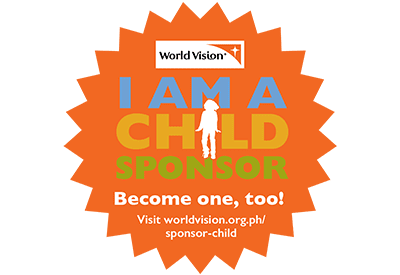 Sadly, the Philippine Tarsier carries only one child per gestation so their reproduce quite poorly especially in captivity so it is true that these Tarsiers are very cute but we should also remember to take care of them by saving their natural habitats and the Tarsiers themselves as well. 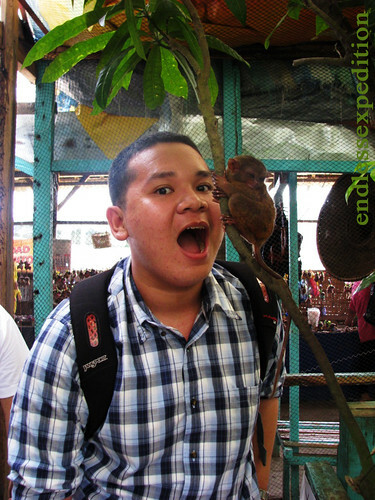 Save the Earth, Save the Philippine Tarsier! I just hope that the time will come that the next generations would still have a glimpse of this beautiful creatures live! Let's not wait wherein the only chance they can get to see these Tarsiers are just by photos and blog posts like these.